Above Photo: At the top of the rock bluff the tree tops are pure white from the snow and frost and in summertime you can see the mountain goats laying down sun baking all seen from the Equity Silver Mine Road Houston, British Columbia. Once again we headed off on a new adventure, this time closer to home. 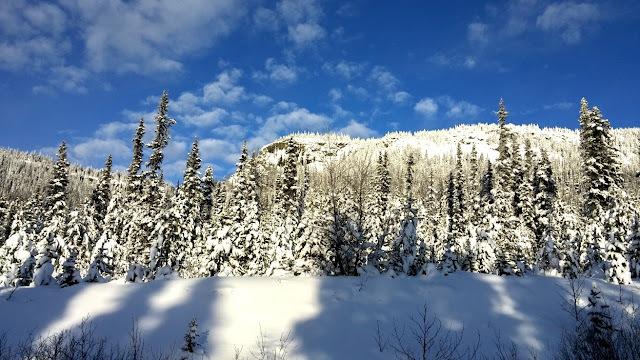 On December 14, 2015 we decided, since it was a beautiful day to take a drive out on the old Equity Silver Mine Road. The road had been ploughed recently so it was like a super highway. The sky was deep blue and the snow crystals glistened in the sunlight. The Equity mine road has been one of my favorite places to visit which is just outside of town. Years back in the summer we would take all the little kids to a spot where they could catch some trout, and it was right at the side of the road. They would cast out their fishing line with a float attached and wait for the float to bob up and down. Of course there was always a juicy worm on the hook.